(ST. PETERS, MO) — At Matteson Square Gardens Saturday night, the St. Chux Derby Chix, ranked #68 internationally by the Women’s Flat Track Derby Association (WFTDA), capitalized on a 26-0 late-bout rally and defeated #20 Arch Rival, 187-183, in a public scrimmage. The exhibition bout was non-sanctioned by the WFTDA, meaning that the end result does not apply to each league’s respective future calculated rankings. However, the SC/DC win was impressive to the 475 in attendance. St. Chux is classified as a Division 2 league in the WFTDA, whereas Arch Rival is classified as Division 1. Rankings applicable or not, the four-point win by the “Pack in Black” was huge for its league. 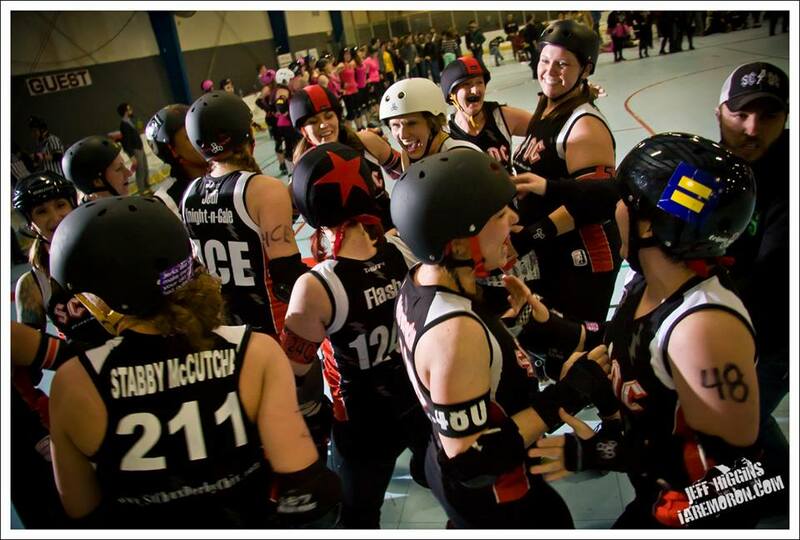 Knowing full well that the bout would be non-sanctioned, Arch Rival utilized the scrimmage as an opportunity for recently added skaters to gain valuable track time prior to its March 22 WFTDA-sanctioned opener at #8 Windy City. Three absent starters from this season’s line-up, and reconfiguration overall due to skater retirements from last year’s squad, gave Arch Rival’s fresh faces a chance to prove themselves. Things seemed to go as planned, and projected, for Arch Rival early. Up 19-11 seven minutes into the bout, ARRG went on a 26-0 run to stretch its lead to 45-11 with 18:35 left in the first period. However, SC/DC countered with a 54-19 run over the next ten minutes. Punctuated by G.I. Jamie’s 24-point power jam scored with 8:10 left in the half, the Pack in Black whittled Arch Rival’s lead to a single point, 66-65. Both teams traded nine-point strikes on the next two rotations and then SC/DC flipped the scoreboard to its favor, 77-75, following Flash’s three pointer scored with 3:00 left in the frame. Arch Rival went on an 18-0 run, paced by Brickyard’s 12-point power jam, to conclude the first period and possessed a 93-77 advantage at intermission. St. Louis’ lead was short-lived as St. Chux regained the lead, 119-106, following Jamie’s 14-point power jam with 22:15 remaining. Arch Rival countered with a 33-6 run over the next three jams. IDA the Living Dead’s 15-point power jam scored with 16:40 left gave Arch Rival a 139-125 lead. Following a 4-4 push in jam 8, SC/DC capitalized on a power jam. A full ARRG penalty box resulted in a 20-point strike for Jamie and a 149-143 lead change in favor of the Pack in Black with 13:05 left. Eight unanswered points scored on the next two rotations pushed the SC/DC margin to 157-143. With 10:00 left, Jamie was sent to the penalty box for a track cut, resulting in a power jam for Arch Rival. Brickyard’s 29-point strike ensued, which gave St. Louis a 172-157 lead. Arch Rival widened the margin over the next three jams and maintained the lead, 183-161, with 5:10 left to play. SC/DC, however, saved its proverbial best for last. A 26-0 bout-shifting run was launched by Flash’s five-pointer scored with 3:00 left. Jedi Knightengale tacked on four during the bout’s penultimate jam to whittle ARRG’s lead to a baker’s dozen, 183-170, with 2:00 left. 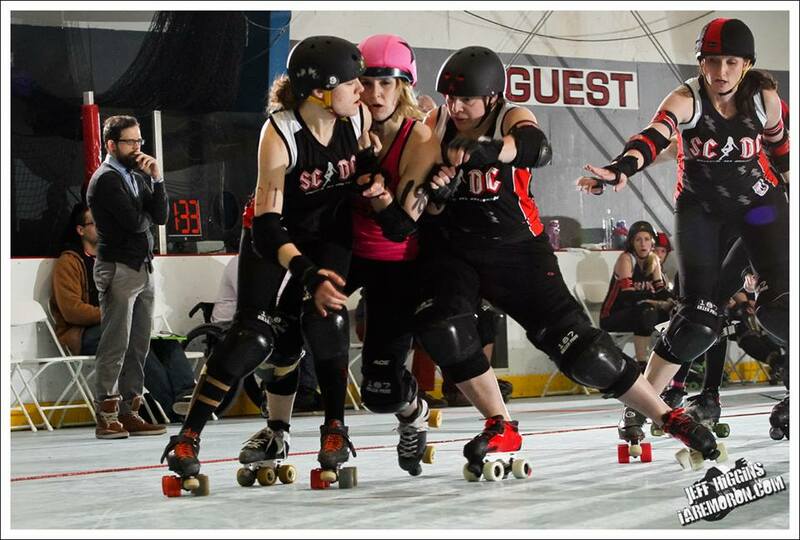 Then on the bout’s final jam, SC/DC’s Jamie raced to the front and grabbed lead. 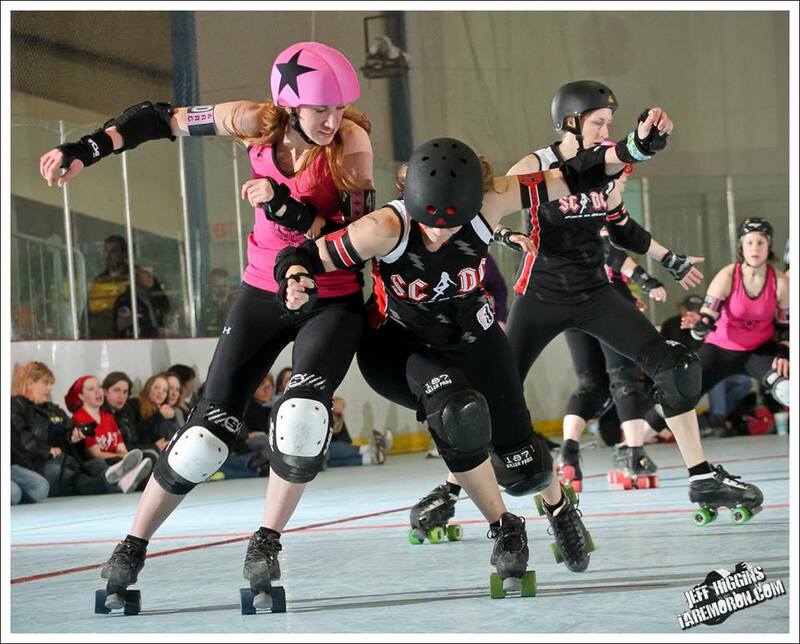 During her second scoring pass, Arch Rival’s jammer was called for a track cut and sent to the penalty box. Jamie went on to notch a 17-point power jam on the final rotation, resulting in a 187-183 come-from-behind victory for SC/DC, who improved to 2-0 overall with the non-sanctioned win. Jamie paced St. Chux scoring with 80 points, followed by Flash’s 42. SC/DC’s Pack in Black continues WFTDA-sanctioned play with a road bout against #85 Old Capitol City on Saturday, March 15 in Iowa City, IA. For Arch Rival, even though the four-point non-sanctioned loss stung a bit, they did realize that Saturday’s scrimmage was valuable and will look for ways to make the missing pieces fit prior to its March match-up with Windy City at UIC Pavilion in Chicago. Regardless of the outcome and its interpretation, both squads benefited from the exhibition and its mutual admiration for each other showed post-bout. ST. CHUX DERBY CHIX: G.I. Jamie 80, Flash 42, Jedi Knightengale 36, Vixen Ta Getcha 18. ARCH RIVAL ALL-STARS: Brickyard 95, IDA the Living Dead 65, Sleazy E 20, Chokehold Chanel 8. In the exhibition opener of the two-bout event, SC/DC’s Hell’s Belles defeated Confluence Crush, 242-90, to improve to 2-0.